iTunes - How to adjust the size of the album artworks? iTunes - How to adjust the size of the ablum artworks? Click on the View Menu > Show View options. First make sure that the following option is selected. Published by jak58. Latest update on March 16, 2014 at 02:23 AM by jak58. 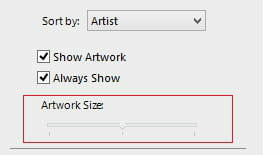 This document, titled "iTunes - How to adjust the size of the album artworks?," is available under the Creative Commons license. Any copy, reuse, or modification of the content should be sufficiently credited to CCM (https://ccm.net/).